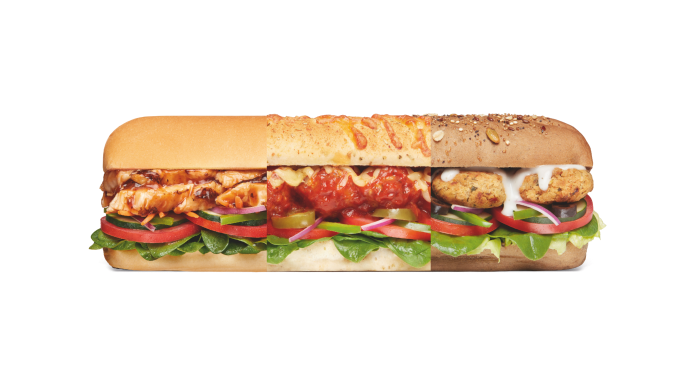 Feel like a flavour-packed sub or wrap? Get Subway delivered to your door! Do you prefer a Subway Six Inch® or a Subway Footlong®? Meatball or Tuna? A good sandwich is hard to beat, but a great sandwich or roll from Subway® is unbeatable. The secret? Super fresh ingredients, tantalising sauces and scrumptious filings. And the bread, the freshly baked bread, soft, irresistible bread. Drool. It’s near impossible to recreate the perfect sandwich at home, and you don’t have to when Subway® Restaurants only employees experts to craft your meal. Whatever you fancy, you can now have Subway® in your home - and you don’t have to go out and pick it up! And, you know that you’ll always have the freshest ingredients and most delicious sub or wraps to keep all that yumminess in place. Order your favourite Subway® sandwich (and don’t forget the cookies) through Menulog and enjoy the experience without having to clean up or pick up. Why settle for a boring homemade sandwich when Menulog can bring you Subway®? It’s a no brainer! There are so many different fillings and exciting flavours to choose from. Seafood, meats, fresh veggies, cheeses and lots of yummy sauces. Tailor your sub to your taste! You can even have it toasted if you prefer. Have you got an event that needs to be catered? Subway® can ensure your office party, family get together or sporting event is a success. Plus, Menulog is on standby to ensure everyone eats fresh!